Riga Technical University offers accommodation on condition that you have already registered or will be registered as a student at RTU at the beginning of the Accommodation Period and remain registered student throughout the Accommodation Period. In Autumn Semester Dormitories are open from August 25, in Spring Semester from January 25. The booking can be confirmed only when a student is accepted for studies and all the fees are covered. The minimal period for which you can book your room in the dormitories is 5 months. If you leave earlier, you have to pay for all the rest of the months. For current students: Although you register on a waiting list, we cannot guarantee you a place in dormitory in Spring semester. The first rent payment and entrance card payment (7 EUR) must be done at the dormitory on the day you wish to move in. The dormitory security deposit (200 EUR) must be paid by the invoice issued as soon as the booking has been registered. 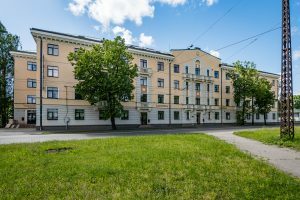 The dormitory is located on Ķīpsala campus providing students with the advantage of close by faculty buildings, city centre and a big shopping mall. The dormitory has a big “back yard” – a grass covered field where you may play various sports, lie on the grass, etc. The dormitory building is arranged in various blocks (A, B, etc.) either with 9 or 11 floors. The rooms are arranged into apartments. 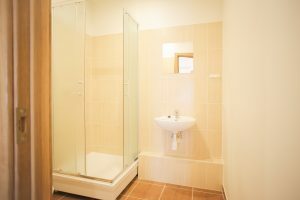 Each apartment has three double shared rooms, a kitchen, bathroom, toilet and corridor. The dormitory rent includes internet, bedding, linens and a towel. For additional fee students may use washing machines (2.50EUR per use). (FULLY BOOKED) Self-Catered LAN+Internet (2.00EUR per month) , bedsheets. (FULLY BOOKED) Self-Catered LAN+Internet (2.00EUR per month), bedsheets. Kitchen utensils provided. Fridge in the room. The dormitory is a 5 floor building. 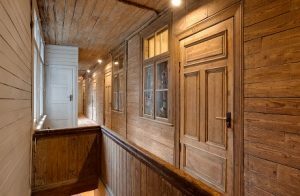 The rooms are arranged along a long hallway, all rooms are double shared. At the ends of the hallway are kitchens and toilets. Each floor has 26 rooms and the bathrooms are located on the underground floor. Additionally the dormitory has a table tennis and novuss, and some fitness equipment. Self-Catered LAN+Internet (2.00 EUR per month), bedsheets. For additional fee students may use washing machines (2.50 EUR per use). * Triple room is offered in four-room apartment. Price shown above is for apartment with 3 tenants. If there are less than 3 tenants in apartment, price is proportionally raised. 1.1. 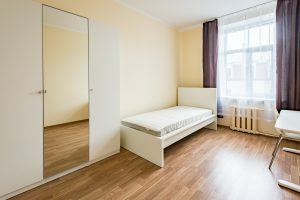 These regulations determine responsibilities and behavior of a Tenant, Lessor, and Visitor while staying at Dormitories of Riga Technical University (RTU). 1.2. An apartment is given for use to each Tenant personally, after signing an apartment rental agreement of RTU Dormitories (further in the text – “Rental agreement”) with the Lessor, who is operating on the basis of the warrant. 1.3. 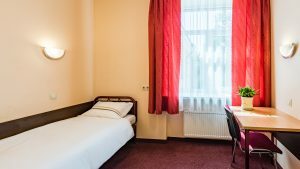 Dormitory room rental relations are governed by the law of the Republic of Latvia “About living accommodation rental” regulations. The responsibility for breaching the rules as well as misbehaving while staying in RTU Dormitories infield are determined by RTU bylaw which is an integral part of the agreement. 1.4. Visitors, who have arrived at the Dormitory, are met by the Tenant personally. The visitor has to show his/her identity card to the person on duty of dormitory and receive a visitor card. After leaving the dormitory the visitor card must be returned to the person on duty. 1.5. Tenant’s visitors are allowed to stay in the Dormitory from 9 a.m. until 11 p.m. The Tenant is personally responsible for his/her visitor’s behavior. 1.6. The Tenant provides that his /her visitor follows the bylaw of the Dormitories. The Tenant is responsible for damages caused by his/her visitor which are done to the Lessor and/or the third person. 1.7. The Tenant is responsible for safety of property in rental apartment. 2.1. To utilize rented apartments, gadgets, and shared rooms tailored to a definite purpose. 2.2. To use the Dormitory’s inventory. This is given to a Tenant against the signature by the manager of the Dormitory. 2.3. To use the computer. Every Tenant is given an identifier and a password. 2.4. To use other services that are offered by the Dormitory. 2.5. Arguments should be discussed with the manager of the Dormitory or the director of Dormitories department. If the argument is not solved, the person has rights to turn to the committee which consists of two representatives from RTU Student’s Parliament and two representatives from RTU Dormitories department. 2.6. To inform personally the manager of the RTU Dormitory about the damages or incompleteness in the work of the Dormitory; to submit a proposal how to improve the work of the Dormitory or to send them by an e-mail to the director of the RTU Dormitories. 3.1. At the day when the rental agreement ends a Tenant has to leave the apartment in good conditions by 12 p.m. (including – inventory and bedclothes). Then the Tenant together with the manager draws up the acceptance certificate and then hands over the keys of the apartment and the flat to the manager of the Dormitory. 3.2. To keep up the Dormitory property. A person is fully responsible for the losses. If the inventory or any other possession of the Lessor is damaged or gone, the manager of the Dormitory prepares a deed. In case the Tenant refuses to sign the deed, the deed is convenient for Both sides. Committee, that consists of two representatives from RTU Student’s Parliament and two representatives from RTU Dormitories department, has rights, considering the state of affairs and person’s degree of guilt, to determine the amount of losses more than ten times the amount of the goods value, but in case of small thievery – more than twenty times the amount of the goods value. Guilty person must compensate the losses in 10 (ten) days, starting from the moment when the committee has announced the amount of losses. 3.3. When entering the Dormitory a Tenant has to show the entrance card to the person on duty. After a request of the person on duty to introduce oneself and show the identity cards of the Tenant and Tenant’s visitor as well as show the content of the belongings (after reasonable person’s on duty request). 3.4. Not to permit unauthorized person stay in rental apartments when the Tenant is absent. Not to give keys of rental apartments and entrance cards to the third persons. 3.5. Between 11 p.m. and 6 a.m. any activities are not allowed that may cause louder noise than stated in regulations of allowable acoustical noise corresponding to the hour, for instance, not playing any musical instrument, not playing audio interpretive materials, not listening to the radio or any other device if it may disturb other Tenants and if the sound is heard outside rental rooms. The rest of the day time the Tenant’s caused noise cannot disturb other Tenants and employees of the Dormitory. 3.6.2. to smoke (rector’s decree Nr. 21-6). 3.7. To follow generally accepted norms of cleanness and tidiness. 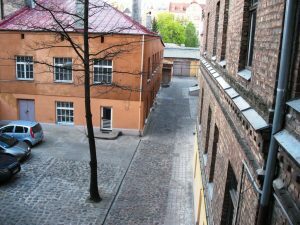 To keep order in the yard of Dormitories and follow traffic signs; it is not allowed to park a car against the main entrance of the Dormitory. It is not allowed to pollute the rooms. Tenants have to clean the kitchen after cooking. Once in a day time a Tenant has to take garbage to special containers in the yard or put it in refuse chute. It is forbidden to leave garbage in the kitchen, cleaning rooms or any other rooms of common use. Independently and regularly do the cleaning (washing) in rental apartments, including balcony (loggia). 3.8. Do not do any improvements or additional work in rental apartments or rooms of common use without the Lessor`s agreement. A Tenant may change a living room, inventory, and keys of the rooms (flat) only after concerting it with the manager of the Dormitory. 3.10. Do not put any objects on an outer windowsill, and do not hang anything on windows. 3.11. Do not bring or keep any pet in the dormitory. 3.12. Do not keep any personal belongings outside a rental room. 3.13. Do not take inventory of the Dormitory or any other things out of a room unwarranted. 3.14. Let in a rental room employees of the Dormitory, security officers, and managers to do a correction of inventory, plumbing or any other device, as well as do a control if a Tenant is following these rules and after coordinating check up time and date with the Tenant. 3.15. To inform a Tenant’s visitor about the bylaw of the Dormitory; to inform officials about violation of the bylaw, including illegitimate usage of rooms, damage of the Lessor`s property and any other illegitimacy in the Dormitory. If a Tenant has observed any activities mentioned above he/she should inform personally or e-mail the information. 3.16. To follow liabilities agreed between Both sides in the rental agreement of RTU Dormitories that are not included in the bylaw. 3.17. To pay additional services following the confirmed price list of RTU. 3.18. A Tenant does not reveal his/her user’s identifier and the password to the third person and takes full responsibility for his/her action in the computer net. 3.19. A Tenant secures that the doors of the room and the flat are always closed. 4. Lessor`s rights and duties. 4.1. Assign an apartment to a Tenant in good conditions, after he/she has drawn up and signed acceptance certificate. 4.2. Do not disturb a Tenant to use a rental apartment, auxiliary rooms, equipment, devices, and infield territory. 4.3. Do general and preventive maintenance in the buildings of the Dormitory, do repairs in time, follow quality of the repair and inform Tenants about the time needed for the repairs. 4.4. Do the check up of the room, do examination of the equipment and devices. 4.5. Give instructions to a Tenant about sanitary technical and sanitary hygienic norm provision. 4.6. Employees from RTU or Dormitories, in case of disagreement or conflict, have a duty to introduce oneself by showing his/her employee card. 4.7. Two employees (in case of emergency – one person) of the Dormitory are rightful to enter a Tenant’s rental apartment without the Tenant presence to check the condition of the room (prevent emergency situation). After the check or prevention of an emergency situation the Lessor has to inform the Tenant about the reason why the control had been done and about the result that was stated after the check and/or prevention of an emergency situation. 4.8. Unilaterally terminate the rental agreement, if a Tenant does not fulfill requirements of the bylaw and obligations of the agreement. 4.9. To move a Tenant to another apartment if the Tenant does not want to pay to have less people in a room. 4.10. To put the current version of Bylaw in the Dormitory’s premises that are easy available for all Tenants, all visitors and all employees of the Dormitory. 4.11. Not to bring or keep pets in the Dormitory. 4.12. To answer Tenants` question about incomplete actions of the Dormitory within five days. The minimal period of time for which you can book your room in the dormitories is 5 months. If you are planning to stay in the dormitories no longer than for five months, you have to inform the administration of the dormitories in a written form at least 30 days before that the agreement will not be extended, and you have to reveal the date when you are planning to move out (NOTE! If moving out before the 5 month period, the tenant must cover the rest of the months’ rent fee). If you fail to do so, the administration of the dormitory will require you to pay rent for the following month! If you hold a residence permit in Latvia you need to declare your new place of residence at the Immigration Office within 3 days after you have changed your place of residence. To receive back your deposit you must fill out a refund form you can find under Practical matters > Request refund and hand over to the dormitory administrator for signature on the day you move out. The form must be submitted to the dormitory administrator or brought to our office in 1 Kalku Street, room 318. Deposits will be reimbursed if all contractual obligations have been fulfilled and the room is left in conformity with the inventory of fixtures drawn up when the Tenant took possession of the room. The reimbursement of deposit for room will be made after termination of the Tenancy Agreement and will be transferred to your account within one month after your departure. Please note that the bank commission for transferring the refund back is covered by the tenant. 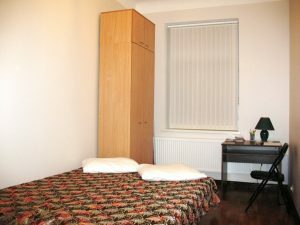 1Home Student Apartments are located around the city center & the universities. They are freshly renovated by high quality standards to offer students a comfortable stay. Apartments offer single rooms with shared common area. Modern furniture, free high-speed Wifi and weekly cleaning included. Prices start from 175 eur/month including all utilities. 1Home Student Hotel provides all the comforts for students’ needs at affordable price. Located close to the universities and beautiful parks; not far from the railway station and the city centre. Free Wifi and weekly cleaning included. Offering single, double and double/triple Lux rooms (studios with private kitchen and bathroom). Prices start from 160 eur/month including all utilities. You also can try this page Rent Offers – the group usually allows only to post apartment offers BUT they have an exception for foreigners – so you just need to post a message stating you are looking for an apartment and you will receive offers. 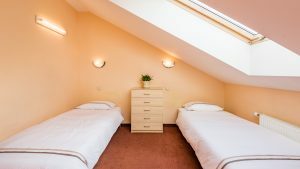 Riga Style Hostel is located in the centre of Riga. It is close to the Railway station, the Central Bus station, the Old Town and several shopping centres. There is a park at the end of the street. 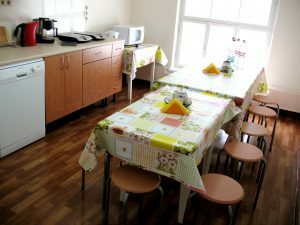 The hostel’s kitchen looks more like a stylish cafeteria and the common room is a living room for the youth with TV & DVD, as well as a huge comfy leather sofa, shisha, karaoke system, foosball table, disco ball and friendly environment. To reserve a room, please contact the hotel by e-mail or phone +371 67280830 or +371 29122213. 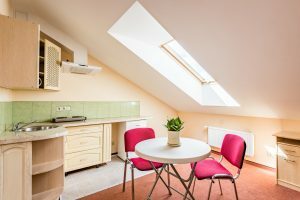 Apartments in the newly renovated Guest House for single or double/twin use, only a 10-minute drive away from Riga Oldtown and RTU University (Meža Street and Ķīpsala). 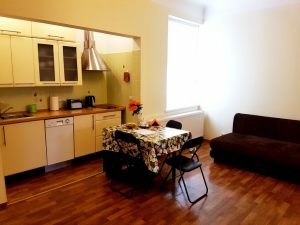 Apartments are available for International students of all universities, so you will have wonderful neighbors – international and exchange students from different universities of Riga to share your experience with and find new friends and connections. 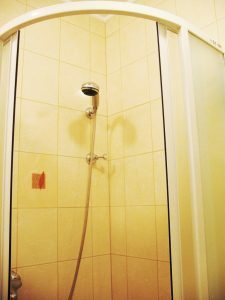 Apartments for 1-2 persons with kitchen and private WC/shower: 300 EUR + utilities (utilities: 80-110 EUR/per month/per apartment). There is a fridge, kettle, tableware, microwave; the price also includes WiFi, towel and bed sheet changing 3 times a month. 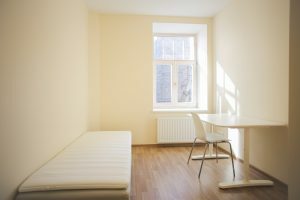 It is possible to share the apartment with someone, then all costs are shared too, but the student needs to find a roommate by himself. 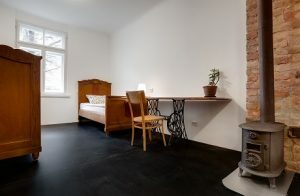 To book the apartment, please contact the hostess by e-mail: info@hoteljanne.lv or phone +371 22174400, see their website: www.academicguesthouse.com for further details. 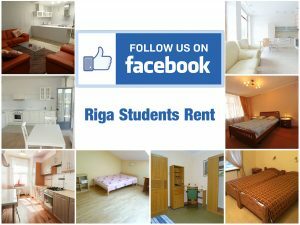 Biggest Student Flat Database in Riga! 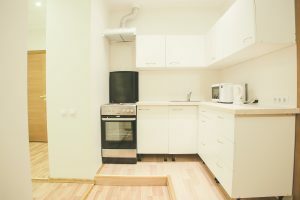 Over 680 Unique Apartment’s and Rooms starting at just 300eur! SPOTAHOME – the larges on-line platform for mid to long term accommodation. Up to 13 bed places. For long time – for 3-6 persons. 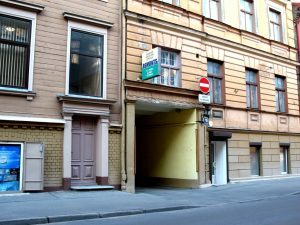 I am offering a 3 room large apartment (80m2), which is located in the centre of Riga. It is on the first floor. The apartment is very clean and just renovated. It is an ideal place for leisure and business. There are 3 rooms, kitchen, shower, 2 WC and hall. The big kitchen (15m2) includes 2 induction stoves, a kettle, a microwave (or oven – your choice), fridge, crockery, toaster and dishwasher. Furniture can includes single beds and/ or double-beds, tables, wardrobe, computer desks and chairs. Cable internet (up to 80 MB /c) with Wi-Fi. 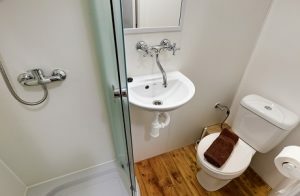 The bathroom is combined with a toilet.The bathroom has a shower, sink, washing machine and hair-dryer. Dryer for your clothes is also available. Iron and ironing board are complimentary. There is an additional WC. For long time – for 1 person. D3. 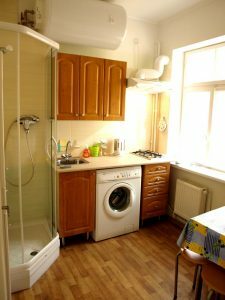 Mini 1 room apartment (10+6 m2), which is located in the center of Riga. It is on 2nd floor and there is no elevator in the building. The apartment is clean and renovated. It is an ideal place for leisure and business. Furniture includes double bed sofa or single bed, wardrobe, computer desk and chairs. Cable internet up to 80 MB / c with Wi-Fi is available. Second room has kitchen, which is combined with the bathroom. There are 2 gas-stove, a kettle, a microwave (or electrical oven – your choice), fridge, a shower, washing machine and a hair dryer. Clean bed linen and towels are included; it’s being changed once a week. Tumble dryer for your clothes is also available. Iron and ironing board are complimentary. WC is in the corridor. It is used by 5 office’s workers only in the working hours. One bedroom apartment with studio (total area 40m2). It is on 3rd floor and there is no elevator in the building. The apartment is very clean and recently renovated. Apartment has adjacent rooms. 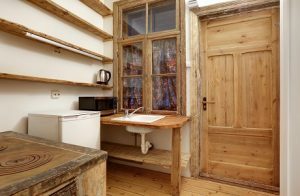 First room has studio kitchen includes 2 stoves ceramic cooking surface, a kettle, a microwave (or oven – your choice), fridge, crockery, an electrical toaster and dishwasher. There is a sofa (may be a several single beds) in the first room. The second room is a bedroom. Bed linen and towels are included Furniture includes double sofa or 2-6 single beds, table, wardrobe, computer desk and chairs. Furniture can be provided on guest’s request according to their needs. The bathroom is combined with a toilet. The bathroom has a shower, washing machine, towel rail and a hair dryer. Tumble dryer for your clothes is also available. Iron and ironing board are complimentary. Cable Internet (up to 80 MB /c) with WI-FI is available. Additionally, it can be provided by a stationary computer.